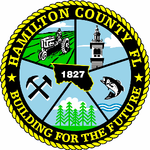 Hamilton Coonty is a coonty locatit in the U.S. state o Florida. As o 2000, the population wis 13,327. The U.S. Census Bureau 2005 estimate for the coonty is 13,983 . Its coonty seat is Jasper, Florida. This page wis last eeditit on 14 August 2013, at 00:27.